Cordoba is a mid-sized city located in the center of Andalucia, in southwestern Spain. 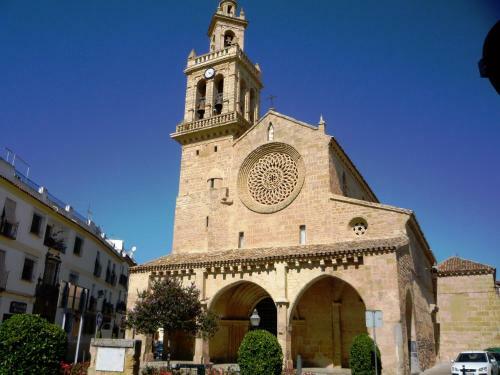 Its historic center is a UNESCO World Heritage Site for the mixture of the diverse cultures that have settled it – first as the capital of a Roman province (Hispania Ulterior), then as the capital of an Arab State (Al-Andalus), and then as a Caliphate. The historic quarter of Cordoba is a beautiful network of small streets, alleys, squares and whitewashed courtyards arranged around the Mezquita, which reflects the city’s prominent place in the Islamic world during medieval times. The city is also known for a dynamic cultural scene, with Flamenco festivals, concerts, museums, and a good nightlife scene. 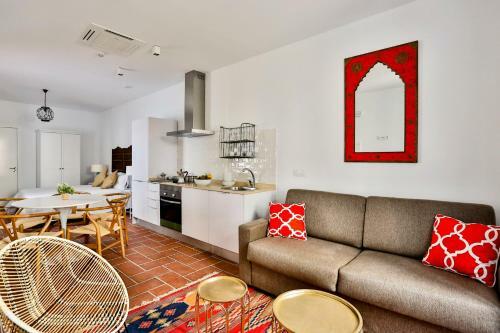 Located in Córdoba, this air-conditioned apartment is 1.4 km from Cordoba Mosque. The apartment is 600 metres from Viana Palace. The kitchen is equipped with a dishwasher. Towels and bed linen are offered in this apartment. Average score from 11 guest reviews: 8.9/10. Situated 400 metres from Cordoba Mosque and a few steps from Cordoba Synagogue, Apartamento Judería 2 offers accommodation in Córdoba. The air-conditioned unit is 600 metres from Los Moros de La Victoria. Free WiFi is provided throughout the... Average score from 24 guest reviews: 8.6/10. The water pressure for shower was high and heated up quickly. Communication with the apartment's owner was very efficient. The apartment is really clean and well maintained. La ubicación es excepcional y el trato buenísimo. La casa está muy bien aunque le faltan algunas cosillas. Para un finde semana largo es perfecta, sin lujos. La ubicacion, y la dotacion de la vivienda y el trato y atencion recibida. Sitio ideal para poder visitar esta bonita ciudad. Osario is located in Córdoba, 800 metres from Cordoba Mosque. Roman Temple is 400 metres away. Free WiFi is provided . The pet-friendly accommodation is air conditioned and features a seating area. Average score from 71 guest reviews: 8.6/10. Even though the owner did not speak English nor Portuguese (only speaks Spanish) we did manage to communicate. We were well received and she was very kind. It is well equipped, we had everything needed to make food and eat in the apartment. There is even a toaster and a microwave. Nice and clean apartment , good space, and good location. Everything worked as expected.. The apartment was very comfortable and had everything we needed for our stay. And it was in a convenient location for the centre and not far from the railway station and all attractions. Nicely styled modern apartment in the historic area. Taxi rank at the end of the street is great for transport when leaving. The apartment is well-situated within walking distance of the old town, but in a non-touristy area so we got a taste of local Cordoban life. The apartment was clean, and Pilar and her son, Pablo welcomed us warmly (although we do not speak Spanish, and they spoke little English). The apartment is a nice size, and all its amenities are new and modern. The apartment was beautiful, very clean, and the shower and beds were perfect. The place was great- nice decor, linens, etc. Perfect location to walk to all sites. Location...convenient to walk everywhere as between the railway station and city centre. Supermarket and El Cortes Ingles very convenient. Wi fi is good. Water is always hot. Very nice and clean place. Stuff are very friendly. Una atención excelente, tuvimos un problema con la Tv y nos lo resolvieron personándose en el apartamento con una amabilidad extraordinaria. Muchas gracias, totalmente recomendable. Apartamento Santa Marina offers accommodation in Córdoba. The apartment is 1.1 km from Cordoba Mosque. Free WiFi is featured . An oven, a microwave and a toaster can be found in the kitchen. Average score from 20 guest reviews: 7.0/10. Really good place to get rest after the whole day walking down the street. 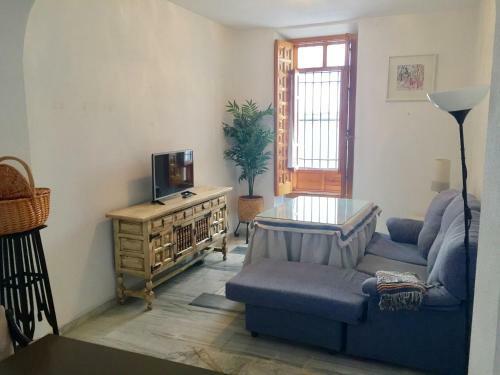 Very nice apartment, quiet and beautiful street with whitewashed house, not farway from Mezquita (10-15 minutes walk). Bastante centrico. Muy limpio y aseado. Mi familia está muy contenta. Para repetir!!! Bien para maximo tres adultos o una pareja con niños, ya que una habitacion es doble, pero la otra es muy pequeña y ruidosa, ya que da a un patio interno. 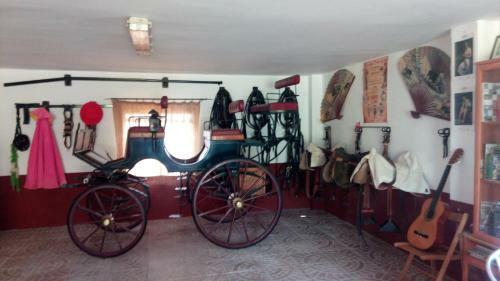 El salon esta muy bien. Tiene una plaza de garaje no muy lejos. 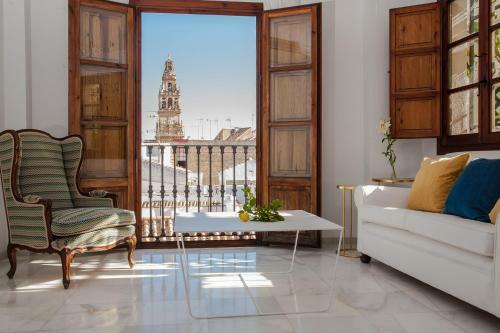 Set 300 metres from Cordoba Mosque in Córdoba, this apartment features a balcony with river views. Guests benefit from free WiFi and private parking available on site. Average score from 44 guest reviews: 9.7/10. Everything was perfect,location ,welcome, very nice flat.Lucas was fantastic. Great apt with all clean and new furnitures. Very good location with two France balcony where could see the River and sunrise in the morning. The owner of this apt named Lucas. We made the deal in the email that we will arrive there around 7:00pm and he already waiting us around 6:30pm. He introduced us about his apt and provide the free water, wine and milk. He's a very nice guy. By the way he is handsome,lol. Fantastic designer apartment with tasteful furnishings, high quality appliances and gorgeous views of the river. Lucas, the owner, has thought of everything: a kitchen stocked with organic wine, condiments and refreshments; umbrellas for rainy days; organic soap/shampoo; and spot-on recommendations for cafes and restaurants. If you have a question or problem, Lucas is always available to help you out. We've traveled extensively in Europe, North and South America, and we love this place so much we can't wait to come back for longer next year. It’s perfect for a short- or long-term stay. Fifteen stars out of ten - highly recommended! It's very clean. The view is superb. The staff is nice, as well as the communication quality especially since it's an apartment and not a hotel I did not expect this to be such a comfortable stay. Great for family vacation. Lucas was very hospitable and helpful. Very comfortable bed, well equipped kitchen, quiet property for a good night's sleep and in easy reach of the key sights in Cordoba. The owner is a young guy, very nice and helpful , was ready to assist in any way, nice parking in the building, very good location. We highly recommend this place. Superb apartment, great localization in the town, very helpful staff. Nao há café da manha no local, mas há muitas opções perto, cama confortável. Precisa prestar atenção pra nao ter banhos tao longos, conosco nao houve problemas. A Localização é ótima, difícil de chegar pois nao conhecíamos a cidade, mas é bem explicado, chegamos sem erro. See all hotels in Cordoba. Option Be is located in the Juderia district in Córdoba, 400 metres from Cordoba Mosque. The rooms are equipped with a private bathroom equipped with a shower. Option Be features free WiFi throughout the property. Average score from 105 guest reviews: 9.7/10. the location itself. everything is excellent jose n his team was incredibly great host. The staff really made this place. They were really warm, welcoming and helpful. Thet had all the useful local information ready at check in as well as a cup of coffee. This hostel has really been set up with the traveller in mind, it was clean, comfortable and has a great rooftop. . It also had breakfast included with orange juice you could squeeze freshly yourself..... So Good. Eeverything ! It was just perfect ! My best hostel ever. People are really nice and kind. I was so lucky to stay here. Also location is very good! All staff members are really great! Good beds, shower and toilet. Free breakfast and fresh orange juice. Everything was great. I was very happy with this place. Very comfortable and clean hostel. Friendly, helpful staff. Great location. Recommended - I'd stay again. Well done! Very friendly staff, always helping out with tips or advise to make the stay in Cordoba really nice. Great location, modern bright and clean. Staff very very helpful and friendly. brand new hostel with great minimalist style decoration (love it! ); all staffs are so lovely & helpful, Jose, Jiwon and others; do join their evening tapas tour lead by their staff, you will meet interesting guests and nice local tapas bar & restaurant; definitely my "option A" if i ever come back to Cordoba! BOOK THIS HOTEL NOWSee all hotels in Cordoba. Patio de la Escalera is an apartment set in Córdoba, 700 metres from Cordoba Mosque. Guests benefit from balcony. Free WiFi is provided throughout the property. There is a dining area and a kitchen complete with a microwave and a fridge. Average score from 27 guest reviews: 9.5/10. The family met us at the appointed time with keys, maps, advice, recommendations and instructions for the apartment. The son had come too to speak English and gave us his own phone number in case we had any difficulties. The apartment was very well located, the parking was convenient and a reasonable price - follow the instructions as given. The apartment itself was so well designed - everything had been thought of. Basics were provided of oil, vinegar, salt, sugar and a present of cava and crisps - a lovely thought, much appreciated. All cleaning equipment and materials were provided too. We will stay again if we return to Córdoba and we will recommend to our friends. This location was quite good for exploring the Juderia, Puente Romano, and the Jardines in Cordoba. It was a brief walk to reach most of the major monuments, the atmosphere was pleasant, and it was easy to find from the train station. Our hosts provided a map of nearby recommended restaurants, and suggested the most scenic routes to walk to nearby attractions. The apartment was wonderfully secure and private. We want to come back and stay longer! All new, or as new. BBC World on TV. V.convenient. The house is well located, facilities are great and good quality. The owners are kind and helpful. Very cozy apartment. Close to the main attractions of the city! Was flexible with the checkin and checkout times. Wir wurden von der sehr sympatischen Gastgeberfamilie begrüßt, die uns dabei auch direkt Tipps zu Gastronomie und Sehenswürdigkeiten gegeben hat. Das Apartment war sehr schön, sehr sauber und qualitativ sehr gut ausgestattet (eher für Eigennutzung als für uns Gäste) ein Begrüßungsgeschenk wurde auch geboten. Wenn Cordoba dann wieder hier, wenn man mich will. El apartamento es muy bonito, nuevo,espacioso para dos personas. La cama cómoda, la cocina completa con microondas, neverita,utensilios y había hasta sal,azúcar, aceite.Ademas nos dejaron una botella de agua,un botellin de cava y un paquete de papas como detalle bienvenida.El cuarto de baño impecable,con jabón y secador. Nos recibió Paco,un amor, nos dio buenos consejos para comer cerca bueno y barato, que ver....Aparcamos muy fácil en la calle cerca del Paseo Victoria pero hay un parking al lado. El apartamento es muy nuevo y está muy limpio. Ubicación excelente. El dueño muy amable. Prima ligging! Prachtig appartement. Schoon, compleet ingericht en een heerlijk bed. Fijne ontvangst met nog als verrassing een flesje cava, snack en water in de koelkast. Een aanrader! Apartamento Calle Leiva offers accommodation in Córdoba, 400 metres from Cordoba Mosque. The apartment is 300 metres from Cordoba Synagogue. Free WiFi is provided throughout the property. Average score from 31 guest reviews: 9.4/10. It was not easy to find the way in the center of Cordoba but it seems this is general. The owner's son helped us find the way to the apartment and the neighboring parking. This apartment was placed just at the edge of old town. Very convinient for us. The apartment hold high standard. Wifi worked perfect. Three minutes walk and we got a breakfast bufe at a hotel. Very nice hosts-extremely helpful: Enrique has had to wait for us the entire day and got us a parking lot!! The flat is so, so sweet and very well positioned. It looks like it has been a very loved place. Breakfast was really good: coffee, milk, cornflakes and croissants:) We've felt well looked after. the host was very hospitable. the flat was excellent condition very clean , neat and very organized. if I will visit Cordoba , I will book it again. the host's son waited me till I put my staff in the flat and guided me to the nearest parking although the clearly mentioned that flat is without parking but he still offering help. plus next day he was following up with about my accommodation as asked if he can help. The place is very well-kept, location is good but difficult to arrive by car as the streets are very narrow. Enrique fue más que amable,nos ayudó teniendo nuestro equipaje y estuvo pendiente de nosotros todo el tiempo,sin duda volveré.El apartamento es muy lindo y los anfitriones superaron todas mis expectativas,los mejores. todo en general. muy limpio y cómodo, muy bien situado. la amabilidad del propietario. El piso muy cómodo, bonito, confortable... la situación genial. El propietario amable. El desayuno estaba bien pero nos iba a poner más bollería y cafe y se olvido y no dio más que para un día. Entiendo que fue un despiste y no lo reclamamos. Las camas muy cómodas. Si volvemos a Córdoba repetiremos alojamiento. Ha estado genial. Impecable: dícese de aquello tan perfecto que no admite el mínimo reproche. Empezando por los caseros, la limpieza, el apartamento, el trato, los servicios auxiliares. 100% recomendable. Ya tengo alojamiento de referencia en Córdoba. Featuring free WiFi and a sun terrace, Mayflowers Hostel offers accommodation in Córdoba. Rooms come with a private bathroom fitted with a bath or shower. A flat-screen TV is available. You will find a shared kitchen at the property. Average score from 184 guest reviews: 9.3/10. everything was beautiful. It may be classed as a hostel, but the double en-suite room we had was luxury. Its location in the old town on a quiet little street was perfect. But the star of the show was the bathroom. Great value for money. Most beautiful hostel I stayed in so far - decorated with Andalusia style, very clean, bright and you can tell the owners really cherish this place. Located just about few minutes from Mezquita, somewhere between lovely white Coroba old town streets, decorated with flowers. It has a nice patio at the roof, where you can take a rest after long day and clean, bright rooms. I stayed with my friend in 5 beds dormitory with bathroom, very well equipped, you get your own locker, set of keys, each bed has a small lamp. It was not noisy or problematic to share the room with other people at all. The breakfast was included and very tasty. The owners are very nice people. I recommend and definitely will go back when next time in Cordoba! Great location, beautiful building, nice breakfast, everything was very clean and the staff were the best!!! :-) Thank you, Jorge & your family, for a very warm welcome! Hope to see you all soon! Great accommodations ... bathroom, kitchen, staff, location, comfort and breakfast, everything was great! I absolutely loved May Flowers! The location is perfect if you are interested in exploring Cordoba's old city! It felt like a typical Spanish Home! Breakfast is included and it was simple but filling. Definitely great value for money! I had super good stay at this hostel. Ended up staying for 3 nights and had a lovely time. Maria Jose was very warm and friendly. The free breakfast in the morning was also super good!! No complaints. The architecture, the buildings are so lovely. I felt like I was back in the middle ages. Best hotel we stayed at so far, friendly, homelike atmosphere, very quiet, 5 minutes to sites and local shops. Old style decor with inner patio. La llave de la Judería is in the old town of Córdoba, next to the Jewish quarter of La Judería. It offers free Wi-Fi and a terrace with views of La Mezquita. Average score from 665 guest reviews: 9.3/10. It's location was right in the hart of the old town. Also the breakfast was great with a very friendly staff. Most beautiful room EVER! This is like being in heaven...seriously. The room was fit for a king or a princess! The staff was amazing...both of the gentlemen who helped us were incredibly kind and helpful. There was a glass of wine upon arrival. They made reservations for us for flamenco. They helped print out tickets. Just an amazing place in a beautiful setting. The location, yet the peace within when you step through the doors. Dog friendly and a lovely room. Perfect location! The staff were amazing and so eager to help us in every way possible. Room was beautiful and comfortable and better than pictured. We only stayed one night and were not ready to leave! I absolutely recommend this hotel to anyone traveling to Córdoba! Great location. Fantastic room with good space. The staff was excellent. Lovely staff, great location, shower,bed. Highly recommended. This is an easy review because everything was fabulous. This hotel is a jewel! El Enganche offers pet-friendly accommodation in Córdoba. Free WiFi is offered and free private parking is available on site. Some units feature views of the mountain or pool. A TV is available. There is a shared kitchen at the property. Average score from 111 guest reviews: 9.2/10. If you're looking to experience Spain country side this is perfect. Very friendly older Spanish owners, gorgeous country house, gorgeous room. Everything! I think it's impossible to find a place better than this. The owners are fantastic people! Can't wait to come again! The staff are the nicest people you d meet on earth! Breakfast was more than you could ask for and room was comfortable. The hosts were lovely. We felt like real guests in their home. The property is located outside of Cordova but very easy to arrive if you have a car and there is no parking problem. They have peacocks, dogs (say hi to Lena for me) and a beautiful horse they would love to talk about. The breakfast was served at the time we requested (they asked the night before) and was delicious. The room was spotless and very big. It was the only room with a bathroom so we took it even though it was expensive, but we took a peak at the shared bathroom and it looked very very good, so I wouldn't worry about taking a room with shared bathroom. Great wifi, the best we had so far in Spain. Great place with great hosts! We spent the wonderful time taking pictures with Andalusian horse, matador's capote, etc. Beautiful Andalucian residence, comfortable bed, friendly, helpful and hospitable owners who shared a bit of their culture. My husband was allowed to try the matador's cape. Enjoyed the typical Andalucian breakfast, including the "huevo hilado". Able to talk closeup photos of the peacocks . Absolutely wonderful owner! Very kind and helpful, advised us reg. free parking in Cordoba, and mentioned a sight nearby (castle shown in GoT) that we hadn't known about and enjoyed a lot. It feels like staying with your own grandparents. The property itself is very pretty with ample and secure parking, and a great pool (didn't try it as it was a bit chilly). We had the deluxe room which was huge, and had an even bigger fully equipped bathroom. Very quiet at night, and the bad was quite good for Spanish standards, so we had a good night's sleep. The (continental) breakfast was prepared with love just for us, and was also very good. Located in Cordoba City Centre, just 200 metres from Tendillas Square, Apartamento Boulevard Gran Capitan offers accommodation in Cordoba. The air-conditioned apartment is 800 metres from the Cordoba Mosque. Average score from 50 guest reviews: 8.8/10. The location was great: situated on the pedestrian mall section of Avenida del Gran Capitán, roughly a 10 minute walk from the train station, and a 10 minute walk down to the Mezquita. The apartment quiet and very clean, and in very good condition. The kitchen was well equipped, and there's a real supermarket just 3 blocks away. Very chic, located in pedestrian area. Fluffiest towels ever. Beer, milk and juice in fridge. Air-con, well equipped kitchen. Oddly found in an office block so not a hotel or block of apartments. All the facilities are perfect and the apartment is so comfortable. 15 min walk from train station , 10 min walk to old quarter. Clean apartment, unexpected breakfast items were provided. Host was readily available by phone and email. We were able to leave our bags early. The apartment is exactly in the center and very good sound isolated. The furniture and the bath equipment is new and modern, even the building as auch is quite old. The owner was flexible at our request, namely to delay the leaving after the rain will stop and this was 1 hour and half after the check out hour. Comfortable, spacious appartment. Location inside an older office building was unexpected, but no problem since the location within the city was great. 15 minutes walk to the Mezquita-Catedral. Well-equipped apartment, kitchen easy to use. Nice soft sheets and fluffy white towels. El apartamento tenía una ubicación inmejorable, el desayuno era completo y muy detallado y el apartamento se correspondía exactamente con las fotos. Estaba todo muy limpio y había de todo. Set 1.1 km from Cordoba Mosque in Córdoba, Laprin Apartment offers accommodation 500 metres away from Los Moros de La Victoria. Free WiFi is provided. Average score from 78 guest reviews: 8.8/10. Great location, close to the bus and train station and also close to the city center. Has a huge supermarket nearby. You have an equipped kitchen with everything. Everything is sooo sooo clean. The host was answering my questions. The attic had a huge terrace!! I felt at home! Was a very pleasant experience, the flat is cute and central, and the rooftop terrace is just great. But please install WIFi, there is none so far. Thanks! Relatively easy access to the sights. The apartment is newly furbished, well equipped and clean. The apartment is on the top floor, which makes taking up the luggages very difficult, but at the same time, you will get a supercool roof-terrace all for yourself. Altogether, a very good apartment for a very reasonable price. Muy limpio y nuevo todo.No dejéis de visitar el zoo de Cordoba , la Mezquita y sobre todo el Castillo de Almodovar del Río que es impresionante. La ubicación,la decoración ,la limpieza la amabilidad de los dueños. Todo muy bien, sólo que es un cuarto piso sin ascensor,por lo que para subir las maletas era un poco incómodo. Por lo demás, estupendo y muy buen servicio. Excelente.Cómodo e impecable. Muy buena atención. Detalles que hacen la estadía mucho más agradable. MUY RECOMENDABLE. Un ático que estaba todo muy limpio. Una terraza muy amplia y bien amueblada. Featuring air conditioning, Urban Vida Alcázar is located in Córdoba, 500 metres from Cordoba Mosque. Cordoba Synagogue is 400 metres away. All units feature a flat-screen TV. There is a seating and/or dining area in some units. Average score from 79 guest reviews: 8.7/10. 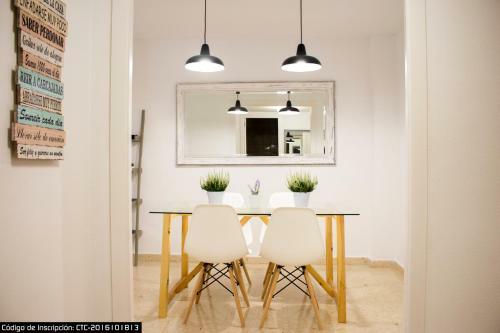 A very stylish, perfectly located, calm appartment in a walking distance from anything you must see in Cordoba. No lost time with check-in and check-out, key-boxes are installed and you get your code the day before your arrival. Just for the record: no hairdryer at the appartment. Beautiful clean room. This property is fantastic. The room is well-stocked with tea, coffee and biscuits. The kitchen was also well-stocked. The furnishings and decor were close to 5 star quality. The property is excellently maintained and we were pleasantly surprised by the beautifully maintained property. Hands down the best place to stay in Cordoba. Great location. Comfortable and clear room. WiFi is good. The apartment was very clean and had high quality furnishings. The main bed was very comfortable and the shower excellent. We were a family of four and we never ran out of hot water. The communication from management was very good and we let ourselves into and out of the apartment without meeting anybody face to face. The apartment is a stone's throw from the main attractions and close to restaurants, etc. Todo, era cómodo y estaba muy limpio y nuevo. Además, la ubicación era inmejorable. El apartamento es precioso la decoración con mucho gusto y tiene todo lo necesario. Ubicación muy buena, se encuentra en zona ya histórica pero si cruzas la avenida principal al otro lado encontramos aparcamiento no muy alejado, y también había un parking pero no nos hizo falta, y al estar todo tan cerca hasta que no nos fuimos, allí se quedo el coche. Todo estaba muy bien, lo recomiendo, espero volver pronto. Offering an outdoor pool and terrace, Villa Lola is situated in the El Brillante district in Córdoba. Free private parking is available on site. Some rooms boast views of the mountain, garden or city and they are fitted with a shared bathroom. Average score from 35 guest reviews: 8.6/10. Me encanto todo, la señora Lola muy amable en todo lo que pudiéramos necesitar, la ubicación es maravillosa y el entorno es muy tranquilo. Un lugar muy recomendable para descansar, y a pocos minutos de los recursos turísticos que ofrece la ciudad. La tranquilidad ,atención y amabilidad estupenda . Muy limpio y precioso entorno de la casa . Le petit déjeuner était excellent et notre hôte très aimable.La piscine très bien entretenue et les transats confortables. Para que todo el mundo se haga una idea, el alojamiento no es un hotel al uso. Es una casa tipo chalet donde se alquilan habitaciones y los dueños viven en una parte de la casa. Los baños son compartidos pero siempre están impecables ya que los revisan después de cada uso. Además no hay esperas ya que hay dos baños amplios para cuatro habitaciones. El mobiliario es sencillo pero está muy bien. El alojamiento no dispone de cocina por lo que no sirven comidas pero te indican un restaurante cercano que está muy bien, con zona infantil y todo. El aparcamiento es en la calle pero es una zona residencial, muy tranquila y segura por lo que no hay problema para aparcar de forma gratuita. La ubicación es muy buena ya que es una zona tranquila que se encuentra a unos 10 minutos andando del centro de la ciudad y su casco histórico. El trato es muy cercano y amable. La dueña encantadora y atenta. L'accueil d'une charmante dame , le petite déjeuné, la piscine, le cadre. La piscine et les chaises longues. Le petit déjeuner servi sur la terrasse. L'accueil de l'hôtesse. Le calme. Accès facile aux bus pour aller en centre ville. Très bon accueil. Parfait pour laisser sa voiture en sécurité. Propreté irréprochable. Coin piscine excellent pour se reposer! Merci Lola! Hotel Cordoba Center is located in Cordoba's "Golden Block", next to the AVE Train Station. It has a 7th-floor seasonal pool with city views. The hotel has easy access to the city's historic quarter and the Mosque, 20 minutes’ walk away. Average score from 46 guest reviews: 8.6/10. Excellent position, near the bus and train stations and a straight well to the old town. Good breakfast in a spacious room. Swimming pool on roof top was great. The hotel rooms were big, as was the bed, which was really comfortable. We asked for a quiet room and we got it, so peaceful. The hotel is about a 10 minute walk from the train station which suited us. The neighbourhood is quiet, which was great after a day in the centre, and had a large Carrefour nearby which saved us a lot of money! One tip, if you are taking the hop-on, hop-off bus - go to the stop at the train station as it is much easier to find and better sign-posted than the next stop, which we went to initially. Good locality to all the places we wanted to see. Very happy with the hotel and would recommend it. Lovely hotel within walking distance of city. Plenty of bars and cafe nearby. Everything perfect. Location, facilities, staff, internet. Full Marks. Located just outside the old town meant the hptel was easy to drive to and parking was good. Only 20 minutes stroll through the parkto the Alcazar and € 5 for a taxi. Reception staff were helpful and pleasant. The pianist in the bar played beautifully! The pool was stunning and the hotel in general was perfect for us. We were able to have food and drink at any time of day in addition to the restaurant opening times. Great location. Parking on site. Comfy beds. Good restaurant and lounge area. Easy access to city centre and historical places. Staff welcoming and helpful. Will love to back again. Recommend. 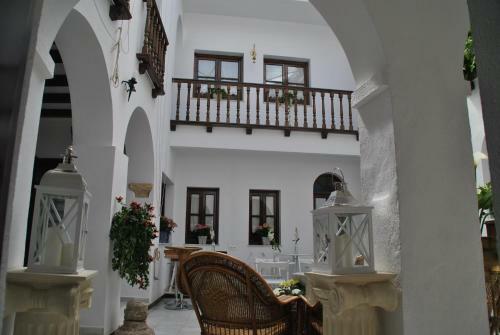 Situated in the Cordoba Old Town district in Córdoba, this air-conditioned apartment is 600 metres from Cordoba Mosque. The apartment is 200 metres from Roman Temple. Free WiFi is offered throughout the property. The unit is fitted with a kitchen. Average score from 14 guest reviews: 8.5/10. Exe Ciudad de Córdoba is situated a 20-minute walk from Córdoba’s historic centre. 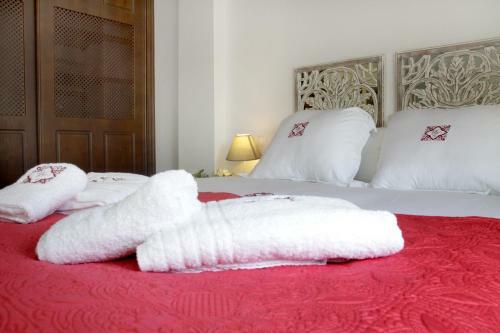 Its functional, air-conditioned rooms include free Wi-Fi and satellite TV. Average score from 34 guest reviews: 8.2/10. everything was excellent, very friendly staff, comfortable room, great breakfast, good location! All staff were friendly and helpful. We used the local taxi service to get into the city as it too far for us to walk. The cost was very reasonable. good comfortable hotel in quieter area of Cordoba. very friendly staff. Good price, easy to reach by car. Nice rooms and great breakfast. Would recommend for a stop on a roadtrip. hi, Family with kids. Tke location good out of city trafic with a lot of parking. At least 3 supermarkets less than 5 min walk. The room big enough and very confortable ecen with 2 kids. The breakfast one of the best like 5 stars, fresh prepared fruit, 3 sort of fresh juice, tasty black coffee, and lot of other things. And for that price, no hesitation, really the best. This hotel had all the little "extras" to make our stay very comfortable. The staff were very helpful and friendly. Eurostars Las Adelfas is set in the residential district of Brillante, 5 minutes’ drive from Córdoba city centre. It features attractive gardens, a seasonal outdoor pool and free WiFi. Rooms at Las Adelfas are bright and air conditioned. Average score from 54 guest reviews: 8.0/10. Location excellent. Free parking on site. Although informed bus stop close by chose to use taxis(total cost 14€) as only staying one night. Would recommend. 1.free parking. 2.clean and quite room. 3.kindly staff. Great edge of town quiet position. Plenty of parking. Great pool, loungers, umbrellas. Free wifi. Room had balcony. Body lotion in toiletries supplied. Wonderful extensive breakfast. Staff helpful - supplied map and explained buses and city parking. Gave us a card for a city bar with free tapas. Lovely hotel verandah at entry - view and grass - with bar service. a wonderful place with very friendly and helpful staff, quiet rooms, free parking, very nice swimming pool - worth to visit! Excellent hotel, professional and helpfull staff.wondrefull breakfast. With Fresh juces. Quiet and clean rooms. Clean and comfortable room with king bed. Great Wi-Fi connection --fast no drop offs. Nice shower with thick towels. Shuttle to downtown was a bonus and return bus ride was easy and only 1.2 euros. Free parking. Easy to find. Lovely location. Bus into Cordoba goes every 30 mins from outside the hotel. 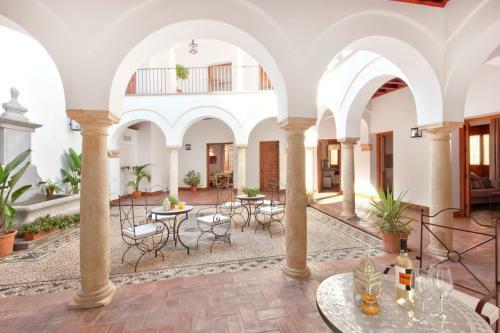 Featuring free WiFi throughout the property, Casa Mari Paz is situated in Córdoba, 700 metres from Cordoba Mosque. Guests can enjoy the on-site bar. Rooms come with a TV. The guest house also offers bike hire. Average score from 54 guest reviews: 7.8/10. central location in old city. A nightmare to find by car but secure parking was most useful. The owner was very nice and waited for me 45 minutes past the allocated check in time. There was a concert taking place in the square in which the hotel was contained. Conscious of this, the owner gave me an interior room. Owner was friendly and the accommodation is centrally located. La habitacion en conjunto estupenda. Y la ubicacion perfecta. Me parecia perfecta si vuelvo me alojare en el. Muy buena ubicación, camadas cómodas, dos balcones a la plaza de la corredera con magnificas de la plaza la Corredera, wifi gratuito, y muy buen trato por el personal, dándonos facilidades en la hora de llegada y salida de viaje. La habitación está muy grande y muy cómoda, la ubicación genial, está todo cerca, hay un supermercado cerca y hay un mercado en la plaza. Die Lage direkt an einem Platz war super. Dort gab es einige Restaurants mit guten Essensmöglichkeiten (Frühstück: 2 Tostadas mit Tomate + 2 Cafe + 1 O-Saft für 6,- EUR). Weg zur Kathedrale: ca 10 min Fußweg. Ums Eck gibt's nen Supermarkt und ca. 5 min entfernt ist eine Bushaltestelle, die zum Bahnhof geht. La ubicación, está en una plaza muy céntrica y bonita. Located 700 metres from Cordoba Mosque, Apartamento Azonaica offers accommodation in Córdoba. The apartment is 100 metres from Roman Temple. Free WiFi is featured throughout the property. The kitchen is fitted with a fridge. Average score from 46 guest reviews: 7.0/10. 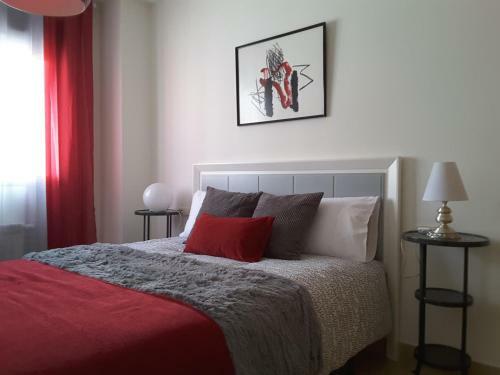 Large apartment (2 bedrooms and living room) with resonably equipped kitchen. Very quiet possition (in backyard) very close to Cordoba´s main attraction. Very spacious apartment, great location! Great host, we stayed one night, excellent price. Good apartment with good wi-fi and noiseless vicinity. Era muy tranquilo y estaba limpio. Muy buena ubicación. Tenía lavadora y secador de pelo, aunque la lavadora no centrifugaba bien. El chico que nos entregó las llaves muy atento y nos ayudó a subir y bajar las cosas. Apartament położony w samym centrum miasta. Obsługa bardzo miła i bardzo pomocna. Ponieważ mieliśmy problem z trafieniem pod właściwy adres (apartament znajduje się w zaułku), zadzwoniliśmy do właściciela, który natychmiast przyjechał po nas i wskazał nam drogę. Wskazał nam również i załatwił miejsce na parkingu dla samochodu. Apartament to samodzielne, niekrępujące mieszkanie w kamienicy. Wyposażenie zupełnie wystarczające do kilkudniowego pobytu w mieście. Uważam, że to bardzo dobra oferta za rozsądną cenę. Polecam. La ubicación es estupenda, la persona que nos realizo la entrega de llaves fue muy amable y atento, nos recomendó un sitio para comer impresionante. Le propriétaire de l'appartement est très très sympathique. Il nous a aidé à monter les valises au 2ème, et surtout à trouver une place de parking gratuite à trois Kms! i l y a par contre une bonne machine à laver. Located 900 metres from Cordoba Mosque in Córdoba, this air-conditioned apartment features free WiFi. Guests benefit from patio. The kitchen is equipped with a microwave. 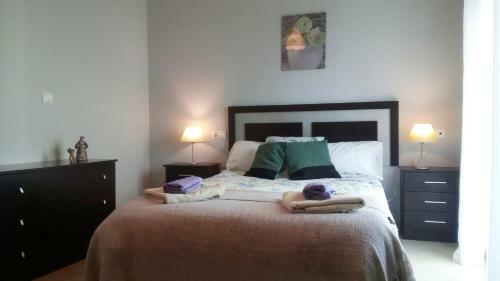 Towels and bed linen are offered at Apartamento La Ribera II. Average score from 13 guest reviews: 9.7/10. 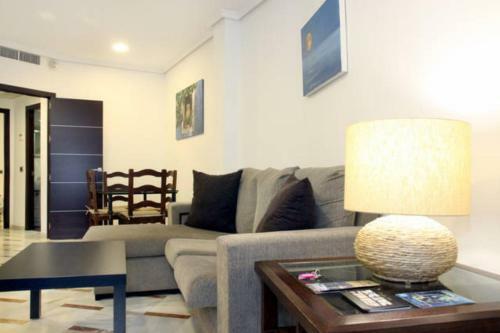 Featuring free WiFi, San Fernando 76 is set in Córdoba, 400 metres from Cordoba Mosque. Roman Temple is 300 metres from the property. All apartments have a seating area, and some include a terrace or balcony with city views. Average score from 175 guest reviews: 9.7/10. Xavier is a perfect host. He is very responsive to my emails and gives gentle reminders and advices. Our thanks to Xavier. Our apartment comes with a patio and we enjoy having our breakfast and resting ourselves there. There is a roof terrace and we spend a good time there watching the religious processions during the Holy Week. Xavier took great care when meeting us to tell us about the apartment, sights of Cordoba, restaurants, etc. The apartment was well stocked with extra food and drink goodies, at supermarket prices, should you not wish to go shopping - though there was a little shop very close by. Convenient and comfortable. Xavier was a wonderful host who met us straight out of the taxi and told us all the great places to go. The apartment was great! We had ample space in the studio and got to sleep next to an ancient roman wall! Xavier was a great host. He gave us a bunch of recommendations for restaurants and tips for touring the city. It was a great location too. Everything was spot on. Nothing at all to complain about. The whole stay was excellent! Xavier and Maria are so helpful and nice. Better couldn't be! The fridge was well stocked and the location was excellent. Excellent location. Very comfortable apartment. Great welcome and service from Xavier- including breakfast, coffee and drinks items provided. Highly recommend for an enjoyable trip to Cordoba. Lovely ground floor studio. Attention to detail. Xavier was attentive and prompt when responding to any queries. Excellent bed and linen. Wonderful to have breakfast foods in the fridge. All of Xavier's recommended restaurants were excellent. Offering a terrace, Apartamento en el corazon de la Mezquita is situated in Córdoba, 200 metres from Cordoba Mosque. Cordoba Synagogue is 200 metres away. Free WiFi is offered throughout the property. All units have a seating and dining area. Average score from 21 guest reviews: 9.2/10. Perfect location! Well equipped kitchen. Super check-in, easy check-out! Toiletries available. La ubicación,y el dueño, Carlos, super atento y nos dio muy buenas recomendaciones para salir y tapear, un 10! Noch zentraler geht es kaum, und dennoch ist es sehr ruhig. Die Wohnung ist gemütlich eingerichtet, das Internet ist flott. Perfecta localización, con todo lo que necesitábamos y a buen precio. Zeer centraal gelegen accommodatie pal in het oude centrum. Zéér vriendelijke host om ons op te vangen en te helpen met de bagage tot op de verdieping. Zalig rustig alhoewel gelegen in drukke straatje beneden. Ideaal gewoon om de oude stad te bezoeken. TOP! La ubicación en pleno barrio viejo de Córdoba y la atención por parte de los propietarios. Resumen:hablábamos de él como nuestra casa. Te hacía sentir así. 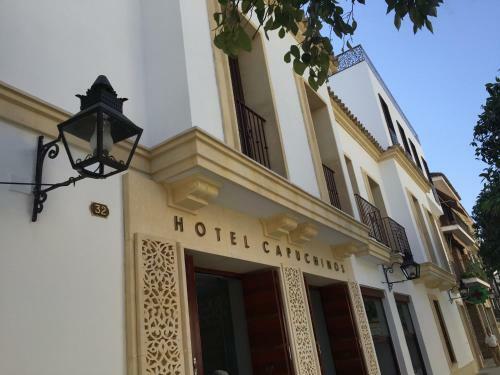 Located in the Old Town district in Córdoba, 900 metres from the Mosque, this elegant 4 star hotel boasts a sun terrace and hammam as well as a wellness area with hot tub and sauna. Average score from 614 guest reviews: 9.2/10. Incredibly helpful and friendly staff; the receptionist explained all the facilities, including the spa. She also pointed out on a map the best places to eat (we followed her advice and had a fabulous dinner) and gave us a guide with opening times for all of Cordoba's attractions. The lady who served us a couple of drinks was also very helpful and pleasant. The hotel is an easy 7 minute walk from the station (even in Cordoba's heat). It isn't in the absolute centre of town (10 minute walk to the cathedral) but we were grateful to be somewhere more peaceful and cooler! Lovely hotel with lots of character. 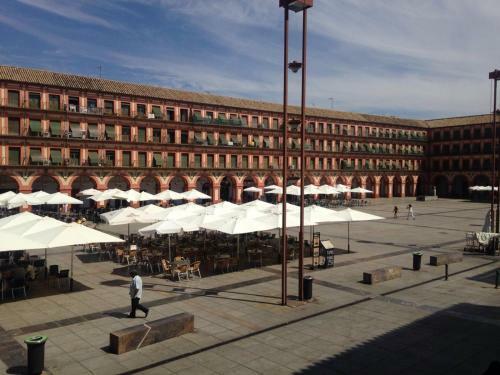 Good location, just outside the tourist area but easy walk to everything you would want in Cordoba. Staff nice and helpful. Beautiful room, great breakfast. The breakfast with plenty of choices: I really liked the delicious fresh fruit,the fresh orange juice and the tasty cheese. It's a small hotel in a very quiet area,newly refurbished, pristine and very clean. The decor of the little courtyard is modern with a moorish twist, very relaxing place. The team is very welcoming. The restaurants nearby are lively.We've been recommended La Montillana by the women at reception and we really enjoyed the food there. the whole setup was fabulous ! we would recommend this hotel for anybody looking for a "boutique" hotel in cordoba ! Super kind personnel, great parking service, central location, nice design and very clean rooms. Well designed hotel and very comfortable beds. Excellent staff and good breakfast. All the staff were super people - helpful, friendly, interesting and informative. Definitely worth taking their advice on where to eat locally. Easy walk to all attractions. 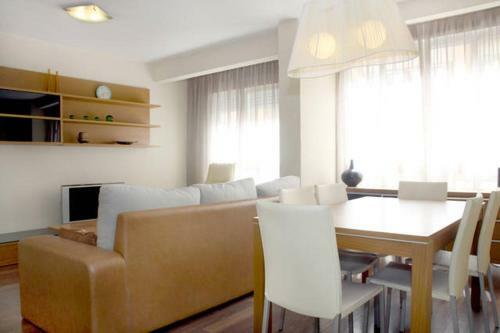 Set in Córdoba, this air-conditioned apartment features a balcony with city views. The property is 700 metres from Cordoba Mosque and private parking is available. Free WiFi is offered throughout the property. Average score from 9 guest reviews: 8.9/10. 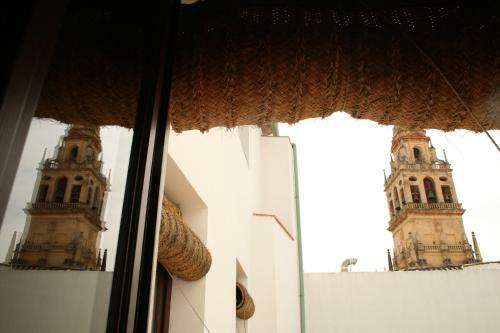 Situated 1 km from Cordoba Mosque in Córdoba, this air-conditioned apartment features free WiFi. The property is 600 metres from Roman Temple and private parking is featured. Average score from 10 guest reviews: 8.9/10. 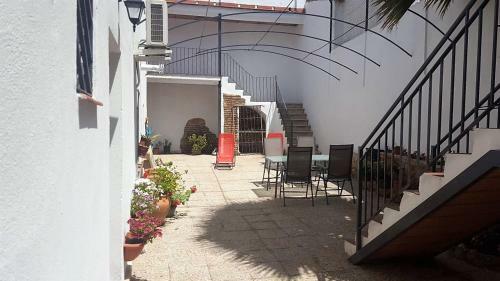 Located 1 km from Cordoba Mosque in Córdoba, this air-conditioned apartment features a patio. The property is 500 metres from Los Moros de La Victoria. Free WiFi is offered throughout the property. Average score from 15 guest reviews: 8.9/10. De eigenaar had 'n plaats voor ons in de parkeergarage omdat parkeren midden in de stad erg moeilijk is. Alles was te voet gemakkelijk te bereiken. Sehr netter Vermieter. Super ausgestattetes Appartement. Gute Klima/Heizung, kostenloses Wifi. Kostenlose Parkmöglichkeit in unmittelbarer Nähe - Parkplatz ca. 2 min Fußweg entfernt. Kurze Wege ins historische Zentrum. Muy buena ubicación cerca del casco historico, detalles de equipamiento excelentes, muy recomendable. La ubicación, la amabilidad del propietario, la limpieza. Todo en general. Martin (el duenyo) cuida los pequenyos detalles, la casa esta limpia as acogedora y bien ubicada, en 15min andando estas en el Centro. Muy recomendable! Muy bien ubicado y el propietario muy atento a nuestras necesidades. Apartamento La Palma is an apartment set in Córdoba, 900 metres from Cordoba Mosque. The air-conditioned unit is 500 metres from Roman Temple. Free WiFi is featured . The kitchen comes with a dishwasher and an oven, as well as a coffee machine. Average score from 50 guest reviews: 8.9/10. Wonderful, comfy, friendly and perfectly placed, simply the only place to stay when visiting Cordoba! The hosts were extremely helpful, informative and generous. We were made to feel like royalty or visiting dignitaries. We could not have hoped for more. We were shown the sights and given local information leading us to fabulous sites, patios, festivals and resturants. Marian and Manuela really made us feel at home. This trip exceeded our wildest dreams, we will certainly be back soon and highly recommend this apartment. Excellent location, quite neighborhood, within striking distance of the river, the old town center, the main tourist attractions and shopping center. Plentiful supply of coffee capsules and other basic necessities in place upon arrival. The owner is very nice and provide some instructions to the city with limited English but helpful. The appartment is fully equipped for everything is needed for a comfortable stay for many days , located at a nice and quiet neighborhood . Highly recommended for families with children since was spacious and the kitchen was very well organized/fully equipped with kitchen utensils . Alex, the host, was very kind and helpful , he provided us with many useful advice for the city/places to visit along with places to eat and drink . There is also a parking place available nearby under payment (which was very convenient since parking in old town is difficult) . Tutto.Cordova e' una bella città'. La casa e' in posizione ottima, ben pulita, dentro il centro storico. Alex, il proprietario e' stato gentilissimo, prodigo di informazioni utili per visitare la città. Tutto bello. 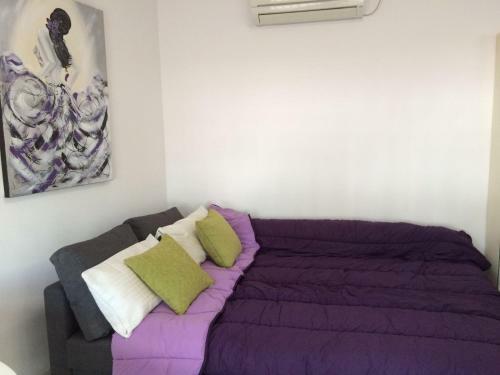 Consiglierei questo appartamento a tutti coloro che vogliono passare 2 o 3 giorni in questa parte di Andalusia. La atención de Alex fue excelente nos brindó toda la información necesaria para poder aprovechar al máximo nuestra estadía en Córdoba, y el departamento increíble, super cómodo!!! Manuela un encanto,limpísimo,cama súper comoda,céntrico y a la vez tranquilo. Muy bien todo en general. Buena situación,mobiliario en perfecto estado,todo como nuevo y la chica de la casa muy atenta. Si vuelvo repetiré sin duda. Príncipe de Viana Apartment is an apartment located in Córdoba, 1.3 km from Cordoba Mosque. The apartment is 300 metres from Viana Palace. Free WiFi is provided throughout the property and private parking is available on site. Average score from 31 guest reviews: 8.8/10. The location was set in the middle of Córdoba so to get to the touristy areas was only a 10 minute walk. Location good, good sized place, area seemed safe, near supermarket. near to the groceries shop. the house is clean and tidy. the owner is so helpful and friendly. The hostess was very warm, welcoming and helpful. The apartment was very clean and had all the necessary facilities. Plus it was located near the main sites. My friends and I had a lovely time. L accueil, les explications, la propreté. Je recommande. Todo me gustó. El apartamento es una monada. Me ha encantado. Las camas, la limpieza. Todo perfecto. La atención previa y en el momento de la recepción fue excelente. El apartamento, a pesar de tratarse de un bloque de viviendas muy antiguo, se encontraba en perfectas condiciones. 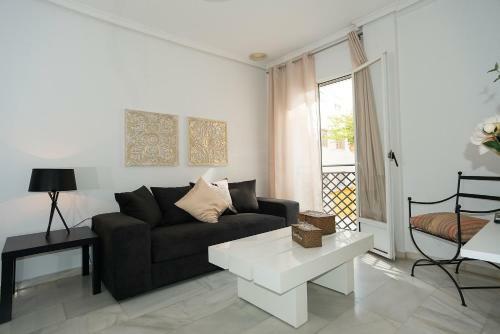 Situated 1.1 km from Cordoba Mosque in Córdoba, this apartment features free WiFi and a terrace. El Atico Del Gran Capitan boasts views of the city and is 400 metres from Merced Palace. A dishwasher and a microwave can be found in the kitchen. Average score from 18 guest reviews: 8.8/10. La situación muy céntrica. Mucha tranquilidad. La terraza muy amplia. Muy bien decorado. acogedor y muy limpio. El trato de la propietaria y su atico un 10 sin duda. Расположение отличное - центр города, достаточно тихая улица, все достопримечательности в шаговой доступности. Удобные кровати, интересная планировка апартаментов, экипированных практически всем необходимым (отсутствует только духовка). Чисто и уютно. Большая терраса с выходом на крышу. Быстрый wi-fi. Очень приветливая и доброжелательная хозяйка Тринидад. С удовольствием рекомендую этот вариант размещения. Szuper, trendi penthouse lakás, hatalmas tetőterasszal. La la ubicación, la terraza y el bar que está debajo (Tapa+tercio de Mahou a 1€). La terraza aunque hubiese sido ideal que estuviera a nivel del piso. Set 200 metres from Cordoba Mosque and 100 metres from Cordoba Synagogue, El Jardín de Wallada offers accommodation in Córdoba. 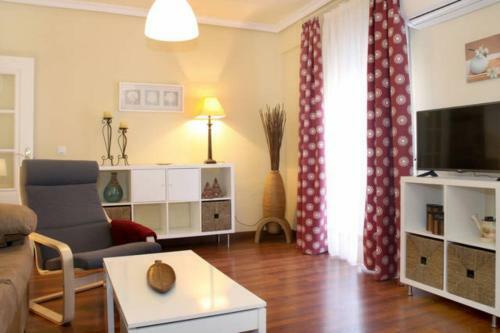 The property is 600 metres from Calahorra Tower and free private parking is featured. Average score from 615 guest reviews: 8.7/10. 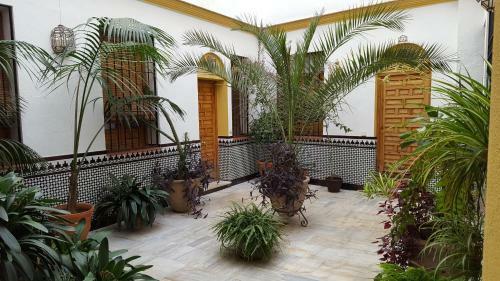 Located 1.2 km from Cordoba Mosque in Córdoba, this air-conditioned apartment features a terrace. 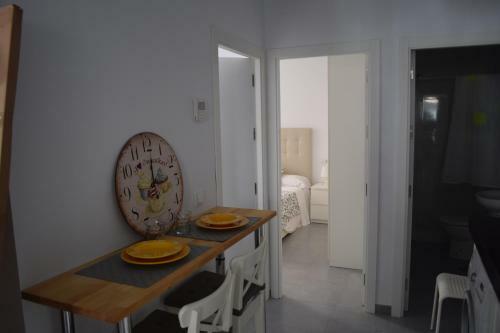 The apartment is 600 metres from Los Moros de La Victoria. Free WiFi is available throughout the property. Average score from 20 guest reviews: 8.6/10. The apartment was large and roomy,the bed was very comfortable.it was within walking distance of Córdoba. Понравилось все. Квартира - супер. Домашняя обстановка. Нас тут ждали: фрукты, конфетки, полный холодильник еды, специи. Очень быстрый интернет, позволяющий просматривать 4к. Парковка напротив, парковаться надо на нижнем этаже, не перепутайте- на парковке нумерация повторяется по этажам. На против апартаментов-хороший супермаркет, советую попробовать вкусные круасаны. Una estancia maravillosa. Además incluye el desayuno, el Wifi gratuito y multitud de detalles que hacen tu estancia más acogedora, hasta el punto que te sientes como en casa. El detalle del parking (incluido y gratuito) es lo más interesante, dada la zona. Teníamos cosas para desayunar (leche, café, colacao, té, mantequilla, mermelada, galletas maria) y algunas cosas de aseo que nos facilitaron la estancia mucho. El parking y la ubicación genial. Justo enfrente hay un mercaxona. Isa estuvo pendiente de nosotros y nos indicó muy bien cómo llegar al apartamento y un ruta muy bonita por Córdoba. Muy acogedor. Bien ubicado. No faltaba de nada, equipamiento muy completo. Detalles de bienvenida muy cuidados. Alegre decoración. La ubicación, las naranjas para el zumo, y las comodidades en general, te sentías como en casa. Casa Sur offers pet-friendly accommodation in Córdoba. The air-conditioned unit is 1.7 km from Cordoba Mosque. Free WiFi is featured throughout the property. The unit equipped with a kitchen with a microwave and fridge. A flat-screen TV is provided. Average score from 22 guest reviews: 8.5/10. Nice holiday house in a 1-2 floor houses sleeping quarters full of mandarin trees. Check-in and check-out is really easy, nice host, easy communication via email and whatsapp. We didn't know the exact time till the moment of entering the city, but still had no problems. The car could be parked just in front of the door. We have wondered that the distance to the historical center is walkable (we thought it's further), still if you have a car is nothing at all. Zeer vriendelijke en professionele gastheer. Ruim appartement Prima faciliteiten Lekkere bedden Op korte afstand naar het centrum / 20 minuten te voet. Auto is dichtbij centrum gratis te parkeren waardoor afstand tot binnenstad 5 minuten te voet bedraagt. Bardzo czysty, położony na uboczu, nie ma problemu z zaparkowaniem samochodu.Do Mezquity ok. 25 minut spacerkiem. Casa muy comoda, economica y buena ubicacion. El barrio impresiona un poco a la llegada, pero no tuvimos ningun problema. le logement est très fonctionnel, 2 chambres avec chacune un lit double et 1 lit simple. les 2 salles de bain et la cuisine sont également fonctionnelles. nous avons été accueilli par notre hôte qui nous a remis les clés et nous donné des informations concernant les visites à faire. il est parfait pour se poser et visiter la ville la journée, le logement se trouve à 15min à pied du centre ville. Muy bien equipado. Amabilidad del personal. Confortable. Fácil de encontrar con buenas comunicaciones y sin problema para aparcar. Located 400 metres from Cordoba Mosque, Apartamento Corazón de la Judería offers accommodation in Córdoba. Guests benefit from balcony. Free WiFi is available throughout the property. There is a dining area and a kitchen. Average score from 19 guest reviews: 8.4/10. 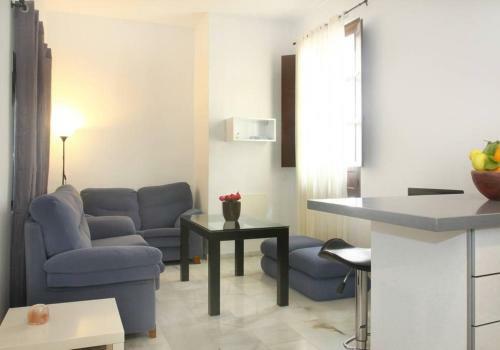 Situated in Córdoba, this air-conditioned apartment features free WiFi. The property boasts views of the river and is 400 metres from Cordoba Mosque. The kitchen features an oven, a microwave and a toaster, as well as a coffee machine. Average score from 15 guest reviews: 8.3/10. La información facilitada por los propietarios y la ubicación. La ubicación no podía ser mejor. El trato del propietario muy bueno: sus indicaciones y sugerencias para nuestro fin de semana resultaron lo de más acertadas y el apartamento se ajustaba a lo ofertado. Buena recepción. Federico nos tenía preparada bastante información y antes de llegar te facilitan un buen enlace. El lugar es muy céntrico y es fácil aparcar al otro lado del río. המארח היה בסדר גמור. הדירה היתה מאובזרת ברמה טובה והמיקום מעולה. Located in Córdoba, Apartamento San Agustín offers self-catering accommodation with free WiFi. The property boasts views of the city and is 1.4 km from Cordoba Mosque. There is a dining area and a kitchen equipped with microwave. Average score from 23 guest reviews: 8.1/10. the apt was nice, all the comforts. ideal for a couple. nice bathroom and kitchen. bed very comfortable. quiet area and just 15 mins walking to the mezquita. l'appartement est propre et bien équipé. il y a même des jeux de société et jouets pour enfant. le quartier est calme et bien situé. Manel le propriétaire est très sympa. il nous a expliqué en détails comment se rendre aux lieux touristiques. il nous a déjà préparé un plan. Apartamento cómodo, con aire acondicionado y el personal muy muy amable nos ayudó en todo lo que necesitamos. Está situado en el centro pero en una zona muy tranquila. Se puede llegar andando en 15/20 minutos a las principales atracciones turísticas. Situado en el casco antiguo cuenta con parking y tiene juguetes para los más peques. Accueil très sympathique de Sylvia. Joli appartement au rdc au calme dans le Cordoue typique a 15 minutes a pied de la mosquée. Parking fermé a réserver (8 euros la nuit). Patio de San Lorenzo is a detached holiday home located in Córdoba in the Andalucía Region and is 1.6 km from Cordoba Mosque. 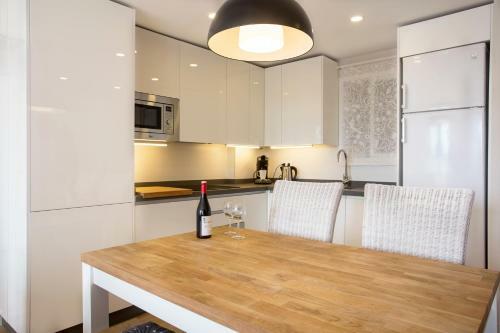 Offering private parking, the holiday home is 500 metres from Viana Palace. Free WiFi is offered . Average score from 16 guest reviews: 7.9/10. La amabilidad de Javier. La ubicación muy buena para moverte por la ciudad. L'accueil du propriétaire qui a pris le temps de me faire visiter le quartier et me faire découvrir sa ville, on sent une vraie passion. Bonne situation pour voir Cordoue. Le centre ville est facilement et rapidement accessible à pieds et le propriétaire donne toutes les informations nécessaires. 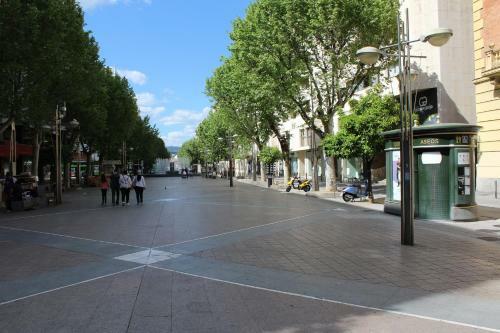 Place de parking à 10€ la nuit pour se garer sur place, commode, mais il a fallu quitter la place à 11h30 le matin même si nous passions la journée à Cordoue. Le propriétaire a été très aimable et nous avons pu très facilement récupérer les clefs de l'appartement. Le quartier est très agréable avec un excellent restaurant à deux pas, fréquenté par les locaux. Set in Cordoba Historic Centre, Hotel Madinat features an exclusive hamman and 2 terraces with panoramic views of the Cordoba Mesquite, located just 300 metres away. All rooms at this hotel are soundproofed, and they offer air conditioning. Average score from 184 guest reviews: 9.6/10. Great hotel with a lot of love put into the final product. Mucho style and grace. 1) Very welcoming, helpful and polite staff. 2) Our room was very beautiful and comfortable. 3) Hotel location is very close to most of the tourist attractions including the mosque/cathedral. This hotel was absolutely exceptional, the character and detail in everything was amazing. Everything was done to perfection and the style and history of the hotel made it incredibly interesting and also pleasing to the eye. I simply cannot recommend this place highly enough, I sincerely hope they expand their chain of hotels so that I can stay in them all around the world! 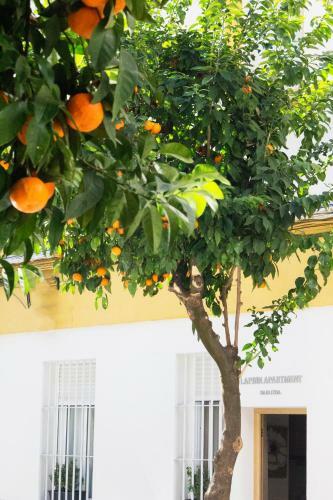 The tastefully renovated hotel is perfectly situated in a beautiful and quiet area of the old city center of Cordoba. The elegant decorated rooms, the patio and the rooftop are giving the hotel an extra dimension. The staff is exceptional, friendly and helpful. This hotel has it all! The owners of the hotel welcomed us very warmly and made us feel at home. Hotel has been decorated with a lot of taste and kept its identity. Each room has its own personlity and is very nicely furbished. And last but not least: the breakfast is a blast! We loved the restoration of this jewel of a hotel! All details have been carefully thought of...fabulous location!! The owners were extremely helpful and in fact one staff member met us in the main square to guide our way with our car to the nearest parking garage which is a stone's throw away from the hotel. We loved our room and all so much that we decided to stay an additional night. Córdoba is gorgeous! We highly recommend this hotel!! Great hotel, great location, very friendly staff, supercomfy bed, nice design, fabulous roof terrace. Very good breakfast, even for me who don't eat gluten. The staff had really made efforts by preparing a whole table full of gluten free bread and bakery. There were also two kinds of lactose free milk. Really nice gin and tonic too (not for breakfast! :-)). Beautiful hotel with amazing staff. They went above and beyond helping us navigate the town of Cordoba. Room was outstanding and was offered a free upgrade when we arrived. We would definitely stay here again! Thank you very much to the welcoming team, especially Mansour who went out of his way to make our little family comfortable, and even gave us a restaurant tour of the area(way past everyones dinner/bed times!!). The hotel is beautifully designed, amazing attention to detail and in a very central and comfortable location. Would go back any given day!!!! 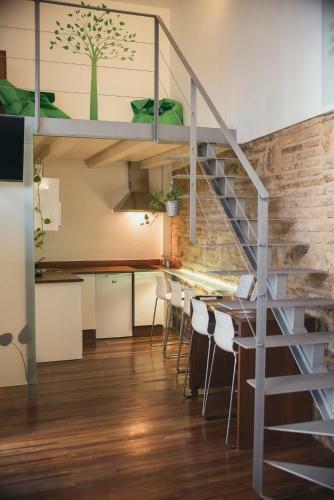 Located in Córdoba, this air-conditioned apartment features a terrace with city views. Guests benefit from patio. Free WiFi is offered throughout the property. The kitchen has a microwave, a toaster and a fridge and there is a shared bathroom. Average score from 18 guest reviews: 9.6/10. La amabilidad y predisposicion de Fernando. Ademas, el piso esta muy bien. Todo muy bien!! El proprietario muy amable y cuidadoso!! El piso muy confortable y bien equipado!! El piso esta en una zona comercial del centro urbano de Cordoba con todo tipo de servicios a mano. Muy amplio ideal para ir con familias con niños o amigos. Heel vriendelijke eigenaar die ons heel hartelijk heeft ontvangen met koekjes en drank! Het apartement was heel aangenaam met alles erop en eraan! Een echte aanrader! Top! 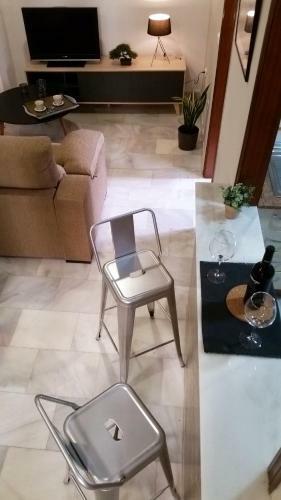 Piso amplio y buen equipado, no le falta detalle que puedas echar de menos, es como estar en casa propia. Lo que más nos gustó fue la hospitalidad del propietario y lo bien acondicionada que estaba la vivienda. 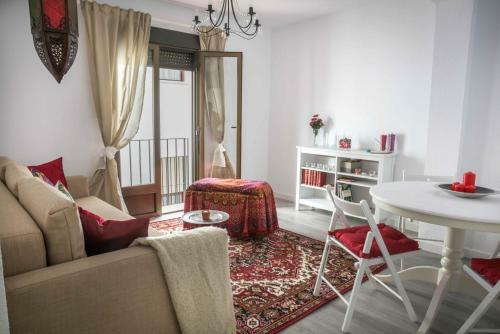 Situated in the Vial Norte district in Córdoba, this air-conditioned apartment is 1.5 km from Cordoba Mosque. The property boasts views of the garden and is 600 metres from Merced Palace. Average score from 39 guest reviews: 9.5/10. Everything. Good location, clean and functional apartment, excellent neighborhood, with shops, bars, restaurants, plus easy access to the train and bus station. Good customer service and clean apartment with good location. Super nette Gastgeberin. Unkomplizierte Anfahrt und Schlüsselübergabe. Sehr schönes Apartment in dem wirklich nichts fehlt. Piso luminoso y cómodo, la propietaria fue muy amable y estuvo pendiente de nosotros toda la estancia. Muy buena ubicación, todo excelente. Un 10. Apartamento muito confortável, limpo, com um mercado em frente muito bom. Excelente localização. Atendimento muito bom da Carmem!!! 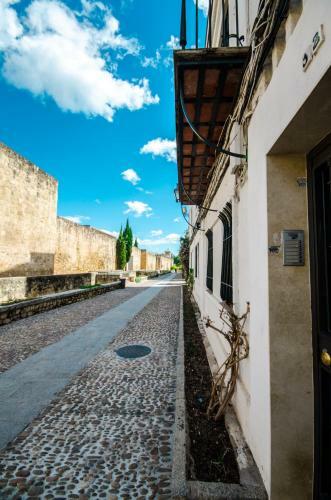 Set in a XVIII century manor, Apartamentos Casa del Aceite is situated in Córdoba City Centre, 500 metres from Cordoba Mosque and the Jewish Quarter. Free WiFi is provided throughout the property. Average score from 295 guest reviews: 9.5/10. Everything was amazing! The staff even helped us with the flat tire. They took it to the shop for us and we picked it up the following day. The parking was very handy! Thank you! We loved it!!!! A beautifull house in the middle of the old town. Wonderfull atmosphere. Lovely hotel in the heart of Cordoba. We can walk to everything pretty easily. It's tugged in a pretty quiet street corner, but very close to stores, etc. The room was just as lovely as shown on website and more. Though, we stayed in the courtyard level room, it still felt very private. Central courtyard is pretty and peaceful. Kitchen has all basic equipment you need for cooking a light meal. Staffs were really nice and helpful. Even they are not on premise 24 hrs, but they are very accessible. It was beautiful, very good for our family. We have small children and they provided a great baby cot. They also provided lovely perks like a bottle of wine and olive oil. I would go back again. Everything. It was perfect. Nice apartment, very friendly staff and wonderful location. Beautiful place in lovely city. Strong recommendation! Very comfortable beds, beautiful wall and floor tiles, very large rooms. Location could not have been better, less than a five minute walk from The Mesquita. New heat pumps gave the rooms rapid heat on a rainy day. Every thing... spacious, comfy, clean, location and the host was super nice with great suggestions! 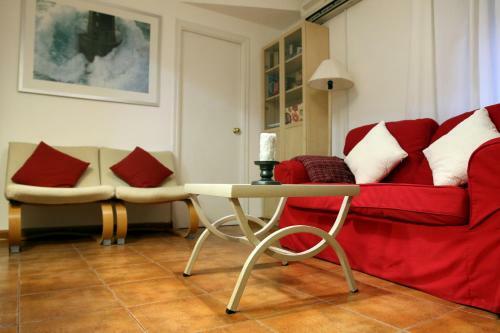 Set in Córdoba, this air-conditioned apartment features free WiFi. The unit is 400 metres from Cordoba Mosque. There is a seating area, a dining area and a kitchen as well as a private bathroom with free toiletries and a hairdryer. Average score from 13 guest reviews: 9.4/10. The venue was spectacular, including a private patio. Todo estaba muy limpio, el piso es acogedor y la persona que lo alquila cuida los detalles. Me pareció muy buena idea el botiquín ya que tuve que hacer uso de él.El detalle de las botellas de agua y la de vino también.Un apartamento perfecto. Gefallen hat die ruhige, nicht direkt an der Straße gelegene und absolut zentrale Lage in einem angenehmen Haus mit Patio und eigenem kleinen Patio. Wir haben uns auf Anhieb wohl gefühlt. Die Schlüsselübergaben waren unproblematisch und nett. Alles notwendige war fußläufig erreichbar. Beim Dauerparken im nahegelegenen Parkhaus den "Abono" vorab im Parkhaus erfragen, da er beim Lösen des Normaltickets nicht gilt. 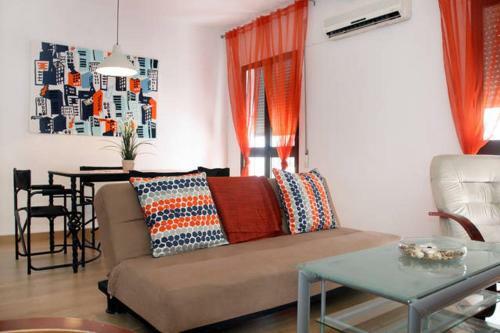 Featuring air conditioning, LOFTS TRIGO 13 offers accommodation in Córdoba. Cordoba Mosque is 700 metres from the property. Free WiFi is provided . Featuring a patio, the accommodation is fitted with a dining area and seating area with a TV. Average score from 160 guest reviews: 9.3/10. We loved everything! Location was central, yet on a peaceful street. The loft apartment was all new with high- end appointments. Jose and Lisa were wonderful and helpful. A must place to stay. All that was needed and more,welcoming and informative staff,Thanks for your help,superb restuarant nearby recommended by staff,faultless,weather not brilliant on arrival,dodged by visit to mosque-cathedral ,although looks as if internal works will close quite an area soon,avoid the coach crowds go early. Very clean and spacious apartment located in a quiet street but not far away from the main sights. Wonderful and hospitable hosts. Great location! A wonderful place to spend time family time! My loft was beautiful had a lovely feeling to it! Had everything we needed and was very clean😊 Thanks for the welcome cake 😋 Beds extremely comfortable and the lady that attended us was very polite and helpful. Location was good on a quiet residential street about 10 minute walk from Mezquita. Large supermarket and shopping center about 10 minute walk. Nice courtyard for relaxing. Rainshower is nice feature, but there are problems with water flow and hot water supply . Comfortable matresses. Courtyard and location were excellent. The hosts were lovely and accommodating and spoke English. La estancia ha sido genial. Los propietarios son muy agradables . 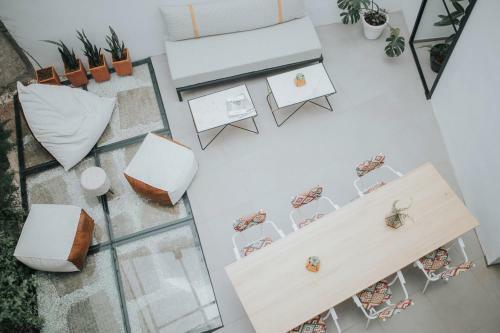 El loft es muy bonito y tiene todas las comodidades. La ubicación es muy buena. Me encantó el trato personal de los dueños. Son muy cercanos. El apartamento de diseño, cómodo , de estos que te encantaría vivir en él permanentemente. Offering a sun terrace and views of the garden, Apartamentos La Hoguera is situated in Córdoba in the Andalucía Region. Cordoba Mosque is 200 metres from the property. Free WiFi is offered throughout the property. Average score from 31 guest reviews: 9.2/10. Key pick-up worked very well although a map of how to get from the parking to the apartment would have been useful for people not having constant internet access to Google Maps. We were greeted by a young man who explained everything and showed us the rooftop terrace. The apartment is nice and spacious, flooded with light and the Wifi worked very well. It was also nice that the hosts left water in the fridge and 2 coffee tabs for the next morning. Location is very convenient 2min walk to the Mezquita, but still no noises at night. La ubicación. Está en pleno barrio de la Judería. Un apartamento cómodo, limpio, con todo lo necesario y con un balcón con vistas a la Mezquita. Nos gustó todo, la ubicación, la vistas, la comodidad del sofá y de la cama, el detalle de la maquina de café... La verdad es que no echamos nada en falta. Totalmente recomendable para visitar Córdoba. Es tal cual lo anuncian, sin engaño. Con una ubicación excelente, amplió y cómodo con todas las necesidades. La ubicación en plena judería de Cordoba, una auténtica pasada. Desde la ventana del salón veiamos la Mezquita y un precioso patio interior. Todo muy mágico y super tranquilo. La casa está bien equipada y todo muy cuidado. Sin duda, un destino para repetir! Nos encantó el apartamento. Tienes desde una cafetera Nesspreso (con cafés de cortesía) hasta una batidora (para hacer salmorejo, receta bordada en un cojín). La cama era cómoda, las vistas increíbles y la limpieza genial. Y la localización, al lado de la mezquita, el todo el centro!. Gloria, quién lleva los apartamentos, estuvo atenta al What'sapp ante todas las dudas que tuvimos. Un placer. todo en general, apartamento muy cuidado limpio ,personal super agradable. Gute Ausstattung, Tuchent war gross genug für 2; 4 Stühle, grosses Sofa- viel Platz zum Sitzen, grosser Tisch für Ablage, Haken überall, wo man sie brauchen kann. La ubicación, el trato del personal, la tranquilidad, el equipamiento, la amplitud, la terraza y la posibilidad de utilizar la azotea. Casa Bartivas offers accommodation in Córdoba, 1.1 km from Cordoba Mosque and 500 metres from Los Moros de La Victoria. The apartment is 700 metres from Comercial Center Zoco Córdoba.. Free WiFi is offered throughout the property. Average score from 12 guest reviews: 9.0/10. 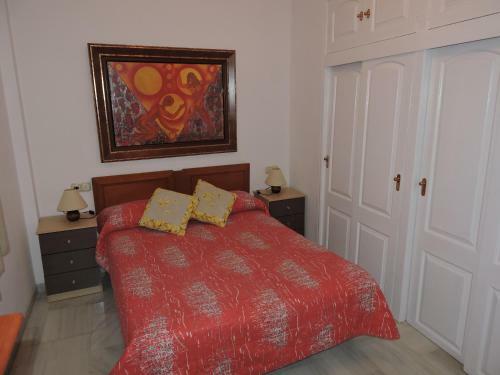 Located 400 metres from Cordoba Mosque in Córdoba, this apartment features free WiFi. The air-conditioned unit is 300 metres from Cordoba Synagogue. There is a seating area, a dining area and a kitchen. Average score from 13 guest reviews: 8.9/10. Located 2.3 km from Cordoba Mosque, Apartamento Las Adelfas offers accommodation in Córdoba. Offering private parking, the apartment is 1 km from Merced Palace. Free WiFi is available throughout the property. Average score from 15 guest reviews: 8.8/10. El propietario muy amable, el apartamento estupendo cumplía todo lo que necesitábamos para un fin de semana. Se puede ir andando al centro sin problema, no cogimos el coche para nada eso que viajábamos con dos niños de 6 y 8 años. Sin duda recomendable. El apartamento es muy agradable y cómodo. Todo muy limpio y accesible. Esta cerca de zonas de ocio y bares,a 10 minutos en coche del centro. Set 200 metres from Cordoba Mosque in Córdoba, this air-conditioned apartment features a terrace with city views. The unit is 300 metres from Cordoba Synagogue. Free WiFi is provided . Average score from 10 guest reviews: 8.7/10. 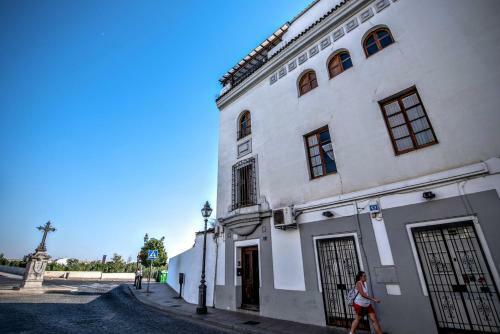 Set 1.2 km from Cordoba Mosque in Córdoba, this air-conditioned apartment features free WiFi and a balcony. The apartment is 400 metres from Merced Palace. Average score from 3 guest reviews: 8.7/10. Set 1 km from Cordoba Mosque in Córdoba, this apartment features free WiFi. The apartment is 300 metres from Merced Palace. Free private parking is available on site. The kitchen is equipped with an oven and a microwave, as well as a coffee machine. Average score from 38 guest reviews: 8.3/10. Great location. You don't need to buy bus or metro tickets to go to places. Behind the building is 5-min walk to plaza tendisillas. And from there you can walk around the places of interests. The other street has small store should you need to buy like water or toiletries. Owners are very friendly and accommodation. The free tour we joined extended, and the owners let us leave our things first inside the house. Very modern, clean and spacious apartment. Loved the fact that there were radios built into the apartment, each room had a radio with speakers in the walls, the radio controls etc. were near the light switches. Very secure area close to a shopping mall. Excellent location Very Secure and safe. Lovely staff. La ubicación es muy buena. El trato recibido excelente. Расположение в центре. Чистота и уют. Дружественное отношение персонала. Наличие своей парковки. Всё было отлично! La limpieza del apartamento y, sobre todo, la ubicación del mismo, muy céntrico. Situación, parking propio y limpieza. Bien equipado. Located 900 metres from Cordoba Mosque in Córdoba, this air-conditioned apartment features free WiFi. Guests benefit from terrace and a terrace. Private parking is available on site. The kitchen is fitted with a dishwasher. Average score from 428 guest reviews: 8.2/10.